I’ve added bacon and shrimps into my okonomiyaki this time round but sometimes I will add in squid rings too, if I have them on hand. Using a non-stick frying pan greatly helps prevent the okonomiyaki from sticking onto the pan, so I suggest you use one to make this too. 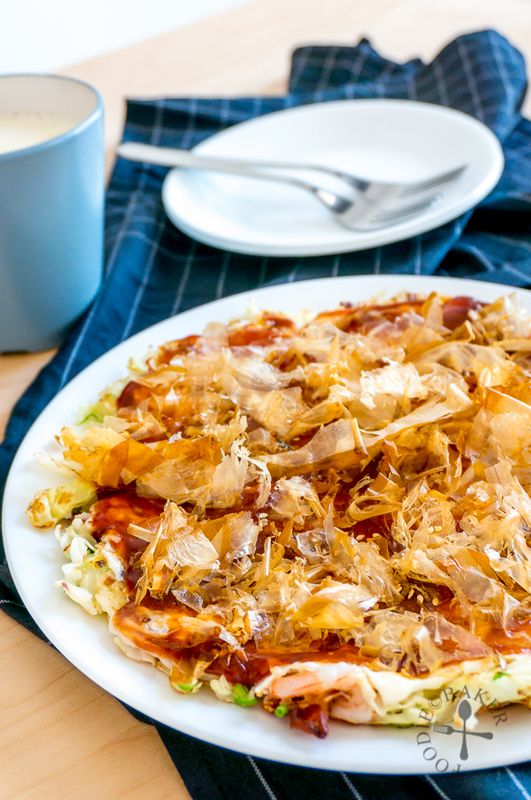 The okonomiyaki sauce is made from scratch because it’s impossible to find it here – and it’s actually not that difficult, just ketchup, Worcestershire, soy sauce and sugar! 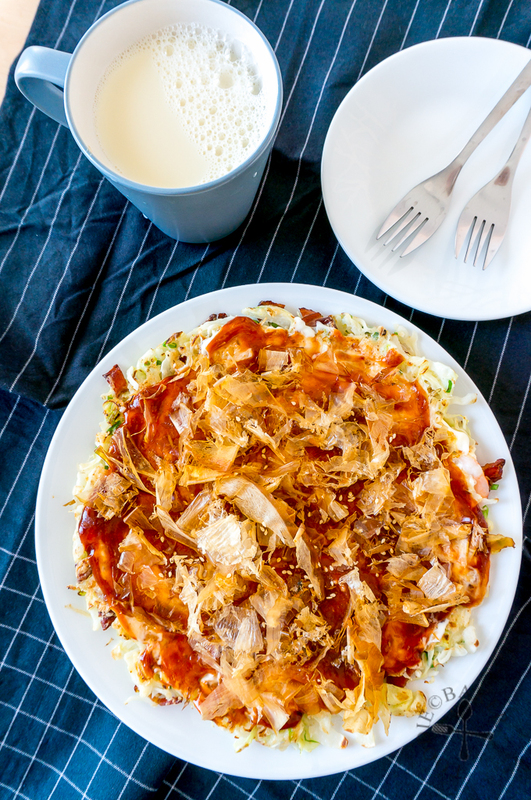 Topped with mayonnaise, okonomiyaki sauce and lots of bonito flakes (I’m glad I brought it back from Singapore), this okonomiyaki is a delicious pancake with endless possibilities! It takes only about 30 minutes from start to finish and helps incorporates a large amount of vegetables into the diet, so I would glad to have it anytime of the day 😉 Here are the step-by-step photos and recipes! 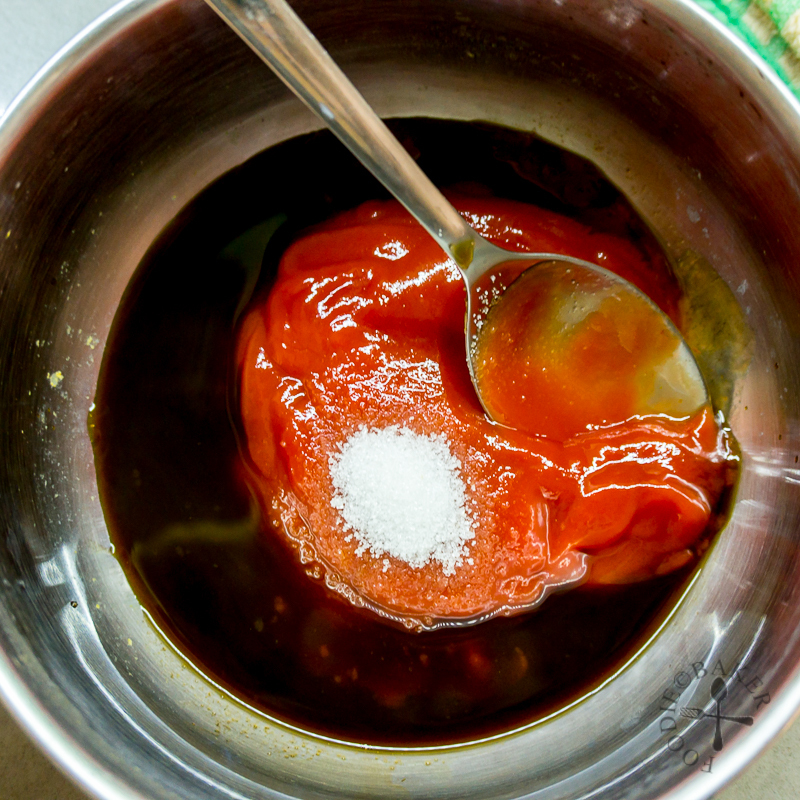 1) Combine ketchup, Worcestershire sauce, soy sauce and sugar in a small pot. Bring to a simmer and stir to dissolve the sugar. Remove from heat and set aside. 2) Pan-fry bacon until crispy. Let cool and crumble into small pieces. 3) In a mixing bowl, whisk together egg, flour, cornstarch, baking powder, salt and water until the mixture is homogeneous. 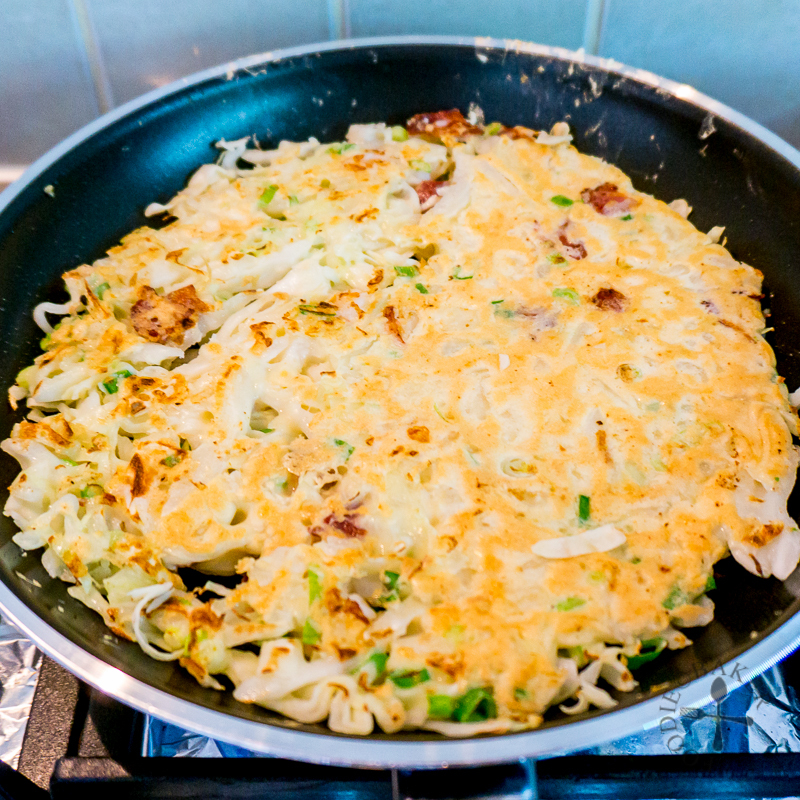 4) Add in cabbage, spring onion, prawns and bacon into the batter and stir with and spoon to coat them with the batter. 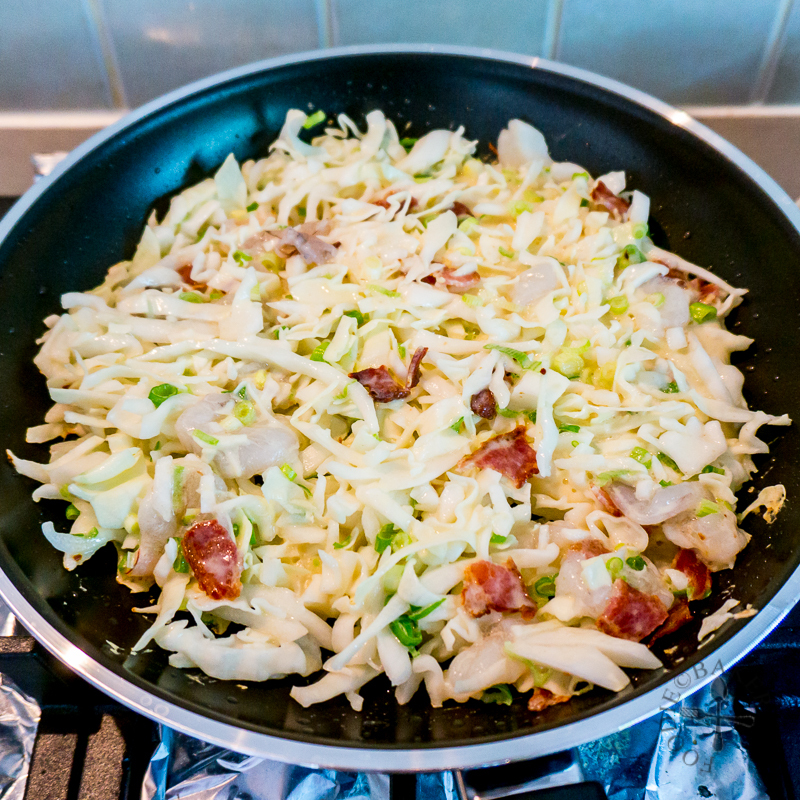 5) Heat the frying pan over medium heat until the bacon fats is hot then add in the cabbage mixture, spreading them out evenly. It should be about 1/2-inch thick. 6) Cook over medium heat for about 5 minutes then flip the okonomiyaki. Press it down gently with a spatula and cook for another 3 to 5 minutes until the prawns are cooked. Top with mayonnaise, sauce and bonito flakes and dig in! Combine all the ingredients in a small pot. Bring to a simmer and stir to dissolve the sugar. Remove from heat and set aside. Heat an 8-inch frying pan (preferably non-stick) over medium-low heat. Place bacon in a single layer on the frying pan and cook until browned and crispy. 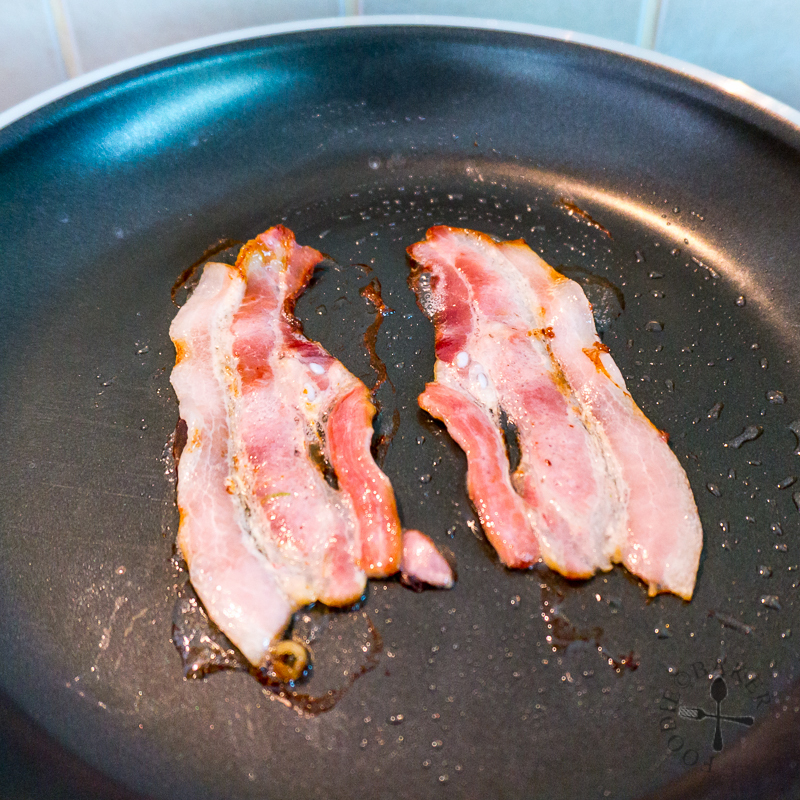 Remove the frying pan from heat and transfer the cooked bacon on a piece of paper towel. When cool enough to handle, crumble the bacon into small pieces. 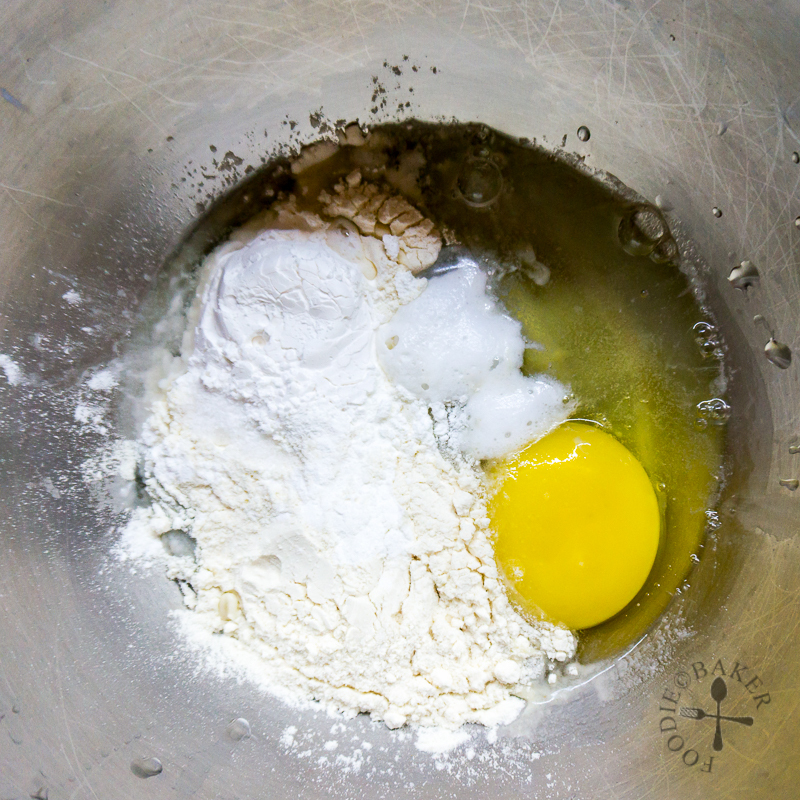 In a mixing bowl, whisk together egg, flour, cornstarch, baking powder, salt and water until the mixture is homogeneous. Add in cabbage, spring onion, prawns and bacon into the batter and stir with and spoon to coat them with the batter. Using the same frying pan, drain off excess bacon fats until you have about 2 tablespoons of fats left (can be less if you are using a non-stick pan). Heat the frying pan over medium heat until the bacon fats is hot then add in the cabbage mixture, spreading them out evenly. It should be about ½-inch thick. Cook over medium heat for about 5 minutes then flip the okonomiyaki. Press it down gently with a spatula and cook for another 3 to 5 minutes until the prawns are cooked. 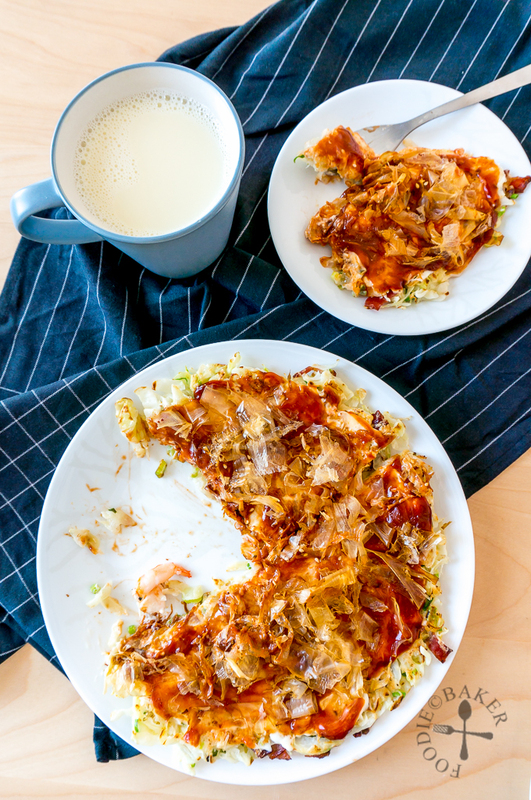 Slide the okonomiyaki onto a serving plate. 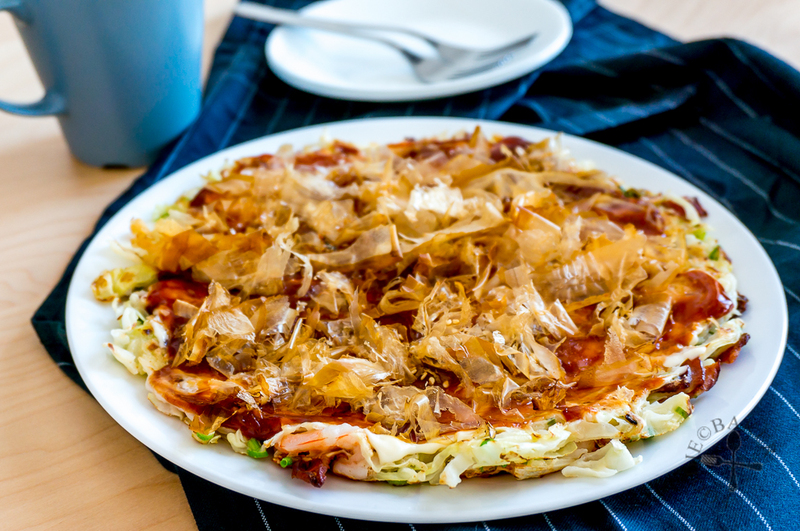 Spread the okonomiyaki with sauce, mayonnaise and top with dried bonito flakes and sesame seeds (if using). Serve immediately. I love Okonomiyaki, and I especially love how you have prepared it with lots of vegetables. It looks amazing and your step by step directions are perfect. Wow, what a savory cabbage dish…it must disappear quickly from the table. This looks delicious! I love Okonomiyaki and had one of my best ones in a small joint in Osaka 🙂 Have you tried putting mochi on it, lends a chewy texture, very nice too! Thanks Gem! I wish I can be in Japan to have an authentic one right now! I’ve never heard of mochi on okonomiyaki, sounds so interesting! This was one of my favorite recipes when living in Japan, fast easy and also so satisfying. Thanks so much for that sauce recipe. Bookmarked for later and shared! Thanks Bobbi! I wish I can be in Japan now to have an authentic okonomiyaki! Jasline, this okonomiyaki looks super good!! I didn’t even know it is from Osaka. Now you are making me salivate. I want to try and make this. I’m zooming to Daiso for bonito flakes!! Hi Grace! I’m sure you would love it, it’s super delicious!